Dhaulagiri is the 7th highest mountain in the world. Dhaulagiri circuit trekking was first discovered by the 1950 by a French expedition team that climbed Annapurna I, and provides stunning views of the whole Dhaulagiri range. Dhaulagiri round is chiefly attractive to people drawn to a high mountain and wilderness, and requires an excellent physical condition and basic mountaineering skills. Dhaulagiri trekking begin from Beni Bazar however the road race to Dharapani. 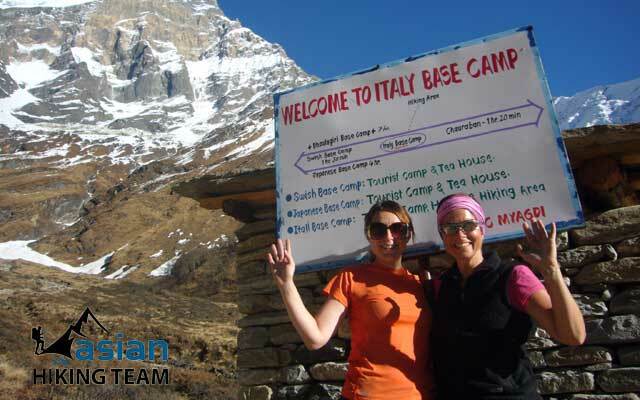 Trekking into Italian Base Camp, there is a basic tea house with beautiful mountain view and terrace. After Italian Base Camp, trekking through the glacier and snow slopes. The final challenge over the French pass (5,355m), also the highest point of the trek, it is not too long an ascent but can be demanding. Descending from French pass, we enter the lonely but fascinating area know as Hidden Valley, this place is one of the few true wilderness areas accessible in Nepal, the Hidden Valley stretches away to the north eventually narrowing to a rugged gorge which connects to Upper Dolpa and Upper Mustang. The trek end in Marpha. We need to organize a full board of camping with necessary guide, cook and porters for the Dhaulagiri circuit trek. 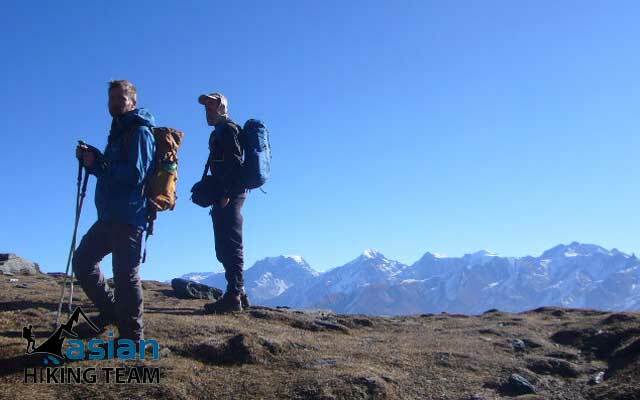 Our staffs carry all the necessary goods and prepare healthy meals during the trek, the accommodation in tented camping. Dhaulagiri round trek start from Beni bank of Kali Gandaki and Myagdi Khola, follow the Myagdi Khola westwards to Darbang and turn north on a tiny trail that leads through forests into the high country. Much of the route is on snow and glaciers as it crosses the French Col (5240m. ), traverses the head of Hidden Valley and crosses 5355m Dhampus Pass. Dhawalagiri treks end Marpha and return to Pokhara either flight from Jomsom or drive to Beni Pokhara or continues trekking to Nayapul. 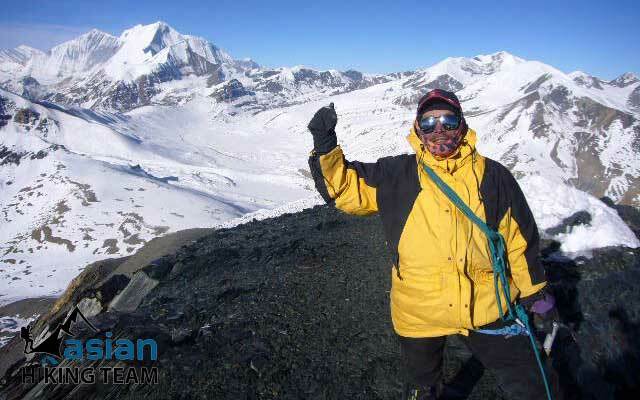 Hightlight of Trekking: Adventure trekking, wilderness areas, the best view of the Dhaulagiri and Annapurna, flora and fauna, macnificent mountain view, culture and people. Day 01: Early morning drive to Pokhara (900m) by tourist bus, 6 hours, 200KM or flight 25 minutes, overnight at Hotel (B/L). Day 02: Drive to Beni (830m), 4 hours, overnight Hotel or Camp (B/L/D). Day 03: Beni to Babiyachaur (950m), 5 hours, overnight Camp (B/L/D). Day 04: Babiyachaur to Dharapani (1500m), 4/5 hours, overnight Camp (B/L/D). Day 05: Dharapani to Muri (1815m), 5 hours, Overnight Camp (B/L/D). Day 06: Muri to Boghara (2050m)4/5 hours, overnight Camp (B/L/D). Day 07: Boghara to Dhoban (2630m), 5/6 hours, overnight Camp (B/L/D). 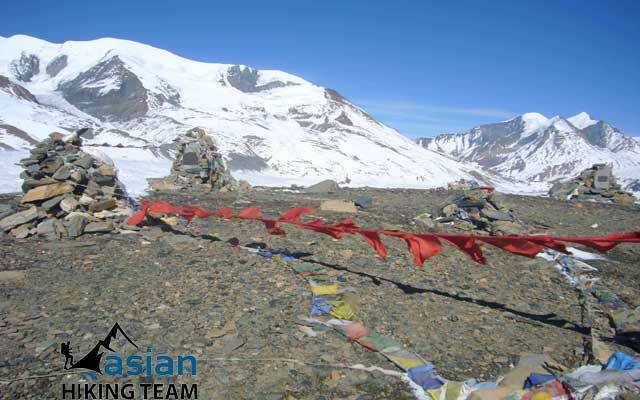 Day 08: Trek from Dobang to Upper Vungini or Italian Base Camp (3660m), 5 hours, stayovernight Camp (B/L/D). Day 09: Acclimatization day in Italian base camp (B/L/D). Day 10: Trek from Italian Base Camp to Glacier Camp, 4 hours, stay in Camp (B/L/D). Day 11: Trek from Glacier Camp to Dhaulagiri Base Camp (4740m), 5 hours, overnight Camp (B/L/D). Day 12: Acclimitization rest day in Dhaulagiri Base Camp, overnight Camp (B/L/D). Day 13: Trek from Dhaulagiri Base Camp to French Col (5010m), 5 hours, overnight Camp. Day 14: Trek from French Col to Alubari (3680m. ), 5/6 hours, overnight Camp (B/L/D). Day 15: Trek from Alubari to Marpha 2640m, 5 hours, overnight Lodge (B/L/D). Day 16: Marpha to Tatopani (1190m) drive by Jeep 5/6 hours, overnight Hotel/Lodge (B/L/D). Day 17: Tatopani to Beni / pokhara, 6/7 hours, overnight in Pokhara (B/L). Day 18: Pokhara to Kathmandu by tourist bus, 6 hours or flight 25 minutes, overnight Hotel (B/L). Note: Itinerary sunbject to change. It is possible to do tea house/Lodge until italian base camp. All land transportation by Tourist Coach,(Trekking pick up & drop). Major Meals; Breakfast, Lunch and Dinner by Lodge menu andTented camping. Hotel Accommodation in Pokhara with breakfast 3 star hotel. Accommodation during the trekking Tented Camping. One cook, Kitchen staff, Sherpa, necessary porters/Donkey/Yek for camping. Kitchen equipments,/ Dome Tent/ Kitchen tent, dinning tent/ Chair etc. All necessary porters and staffs. Trekking Equipment such as Sleeping Bag, Matres and trekking Polls (if needed as clients request). Drinks except tea and coffee during trekking. Payment should be made 25 % of total amount in advance. Full amount must be paid before your trip starts. Day 01: Early morning drive to Pokhara (900m) by tourist bus, 6 hours, 200KM or flight 25 minutes, overnight at Hotel. From Kathmandu to Pokhara which takes about six hours. As you climb out of the Kathmandu valley, only to quickly descend again to the Trisuli River, you follow upstream to its junction with the Marsyangdi River. You follow the Marsyandi gently up through heavily terraced fields and small hill towns to the Seti River that takes you directly into Pokhara. Having pleasant weather, Pokhara is tourist's paradise with full of natural as well as cultural heritage sites such as lakes, caves, temples of Buddhist and Hindus along with mountains, or 25 minutes flight can reach Pokhara, Overnight in Pokhara at Hotel. Day 02: Drive to Beni (830m), 4 hours, overnight Hotel or Camp. After breakfast, drive from Pokhara goes through uphill into zigzag road all the way to Naudanda. It then descends through zigzag road passing Hangza, Naudanda, Nayapul, Kusma with views of Annapurna South, Fish tail, green hills, terraces and villages. This is one of the picturesque road journeys. Overnight in Beni Hotel/Camp. Day 03: Beni to Babiyachaur (950m), 5 hours, overnight Camp. 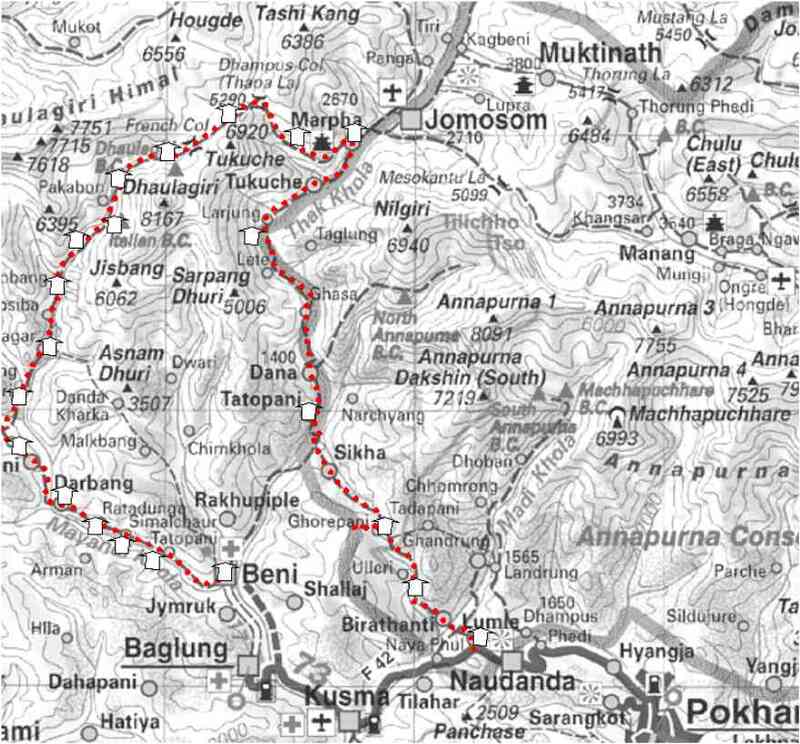 Trek from Beni to Babiychaur which takes about 5 hours. Start Soon the rough rubble gives way to the smooth ice of the white part of the glacier. You climb steadily to the rough and chilling but spectacular Dhaulagiri Base Camp, it is possible to drive is seasonable road, overnight Camp. Day 04: Babiyachaur to Dharapani (1500m), 4/5 hours, overnight Camp. This day your trek gently ascend for early one hour passing through jungles with varieties of oaks, rhododendron and so on. You can hear the chirping of the local birds then your trails follow quite flat land passing through stream at one place. The way you trek is muddy road crossing villages at some of the places. There is a beautiful camping site. Overnight camp. Day 05: Dharapani to Muri (1815m), 5 hours, Overnight Camp. Trek from Dharapani to Muri which takes about five hours. This day also you trek ascend through narrow path for early one hour. Along the flat land passing through jungle with varieties of rhododendrons, oaks and Christmas trees at some distance. Overnight camp. Day 06: Muri to Boghara (2050m), 4/5 hours, overnight Camp. From Muri the trail is easy and goes down for few hours. But before to reach at Boghara, we have to climb a steep path for a couple of hours. The trail descends down before reaching Phedi and then the trail ascends up until Boghara, 4/5 hours, overnight Camp. Day 07: Boghara to Dhoban (2630m), 5/6 hours, overnight Camp. Today, the path is quite difficult and sometimes we will need the help of the ropes. The trail descends down to a small ridge then crosses forest to Jyardan. Finally, we cross the rocky part to arrive at Dhoban, 5/6 hours, overnight Camp. Day 08: Trek from Dobang to Upper Vungini or Italian Base Camp (3660m), 5 hours, stay overnight Camp. At this juncture, we will reach the Italian Base Camp where we will camp just in front of the West wall of the Dhaulagiri. Passing through beautiful forest, we rapidly gain altitude and mountains burst out all around. Since, we are gaining altitude rapidly, we keep our self hydrated and take it easy, 5 hours, stay overnight Camp. Day 09: Acclimatization day in Italian base camp 4250m. Today is first day of our acclimatization day. you can explore around the valley. Make preparation for high passes, overnight in Camp. Day 10: Trek from Italian Base Camp to Glacier Camp, 4 hours, stay in Camp. It takes about four hours. After crossing the first glacier, probably using a rope in a couple of tricky spots, you climb onto the main glacier. The surroundings are spectacular which makes up for the rough and dangerous trail. You may also use a rope on this section. This is a particularly tough day. You camp on the glacier rubble. Day 11: Trek from Glacier Camp to Dhaulagiri Base Camp (4740m), 5 hours, overnight Camp. Which takes about five hours. Soon the rough rubble gives way to the smooth ice of the white part of the glacier. 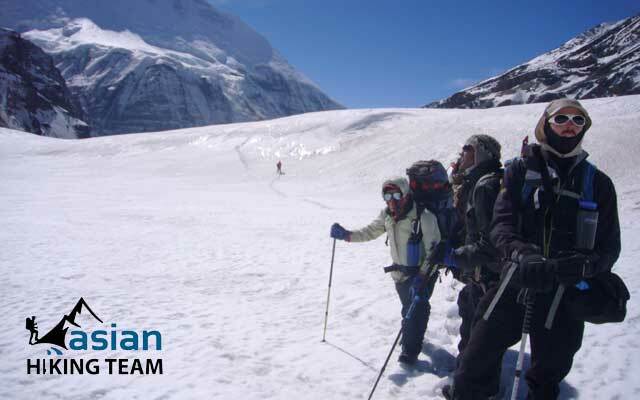 You climb steadily to the rough and chilling but spectacular Dhaulagiri Base Camp, overnight Camp. Day 12: Acclimatization rest day, overnight Camp. Today is second day of your acclimatization in Dhaulagiri pass trekking, explore around Dhaulagiri base Camp, safe energy for next days, overnight Camp. Hidden Valley and it takes about four/five hours. Getting off the glacier above the base camp often requires rope climbing. Once over the steep moraine walls we reach gentler, less strenuous country. After a breathless climb to the top of French Col (5300m,) the views of Hidden Valley open out. The broad valley is reminiscent of Tibet and Ladakh and so are the temperatures (at least -20ºC at night), overnight Camp. Day 14: Trek from French Col to Alubari (3680m. ), 5/6 hours, overnight Camp. After climbing over the 5200m Dhampus Pass, Your traverse avalanche-prone slopes and then take on the steep descent to Yak Kharka, continues to Alubari, Overnight in camp. This day you trek through bare land for some distance. Note: If you are looking Dhampus Peak Climbing you need one day or two days extra. Day 15: Trek from Alubari to Marpha 2640m, 5 hours, overnight Lodge. which takes about five hours.More steep descent leads to Marpha. The way is not much covered with trees. En route you can see some yak herds and sheep herds as well. Overnight in Hotel/Lodge. Day 16: Marpha to Tatopani (1190m), 5/6 hours drive by Jeep, overnight Hotel/Lodge. After breakfast drive by Jeep or bus following the Kaligandaki valley, crossing Kalapani, the trail descends steeply up to Rukse Chhahara (Rukse Waterfall) which is amazing to look at. There is situated the deepest gorge of the world between two mountains Annapurna I (8091m.) and Dhaulagiri I (8167m.) facing each other near Rukse Waterfall. The trail again descends slightly to Tatopani through different human settlements. You can enjoy the hot spring at Tatopani as the word Tatopati is termed after the natural hot spring situated at the bank of the Kali Gandaki river. It is popularly believed that taking bath in Hot Spring helps you to get rid of skin diseases. Along this, it gives you physical and mental refreshment as well. 5/6 hours.Overnight in Lodge. Day 17: Tatopani to Beni continues to pokhara, 5/6 hours, overnight at hotel. Drive by Jeep or bus to Beni Bazaar continues drive to Pokhara, 5/6 hours, explore Pokhara if you have time, overnight at hotel. Day 18: Pokhara to kathmandu by tourist bus, 6 hours, or flight 25 minutes, overnight at hotel. Early morning drive to Kathmandu by tourist bus, 6 hours, 200km, over the beautiful rive and mountain view or take fight 25 minutes to Kathmandu, transfer to hotel overnight at hotel. Book Now 10 % Up until 30 Aug 2018 !! !